Do you have rubbish in your home that you want to get rid of? Maybe your office is cluttered with junk? Are you hoping to clear your garden to make the most of it? 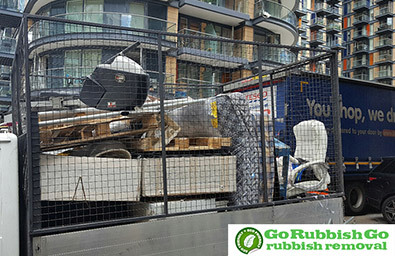 Contact Go Rubbish Go today for a range of budget-friendly SE3 rubbish removal services that will never let you down! We’ll send you experienced and friendly teams to clear, collect and dispose of your rubbish so that you won’t need to. Our rubbish clearance services will save you time and effort, and you won’t need to rent a van or worry about skip hire! Enjoy high quality waste disposal services at low prices – call us now on 020 8610 9182 to book with us today! With us you can make excellent savings and make your money go further! We strive to bring amazing value to all of our customers, with budget-friendly prices and highly competitive offers. With lots of special discounts regularly available we’re confident you won’t find as professional a service for such affordable prices. If you’re looking for waste clearance in Blackheath that won’t break the bank then you don’t need to look any further! Call our rubbish disposal SE3 team now on 020 8610 9182 to receive a free estimate with no obligation needed! See how much money you can save by getting in touch with us right away! Why We Are The Most Reliable Blackheath Waste Removal Company? There are lots of reasons why you should hire us, from our attention to detail to our fantastic deals and offers! If you hire us you won’t need to worry about hidden costs and fees and with our money-back guarantee you can hire us in confidence! 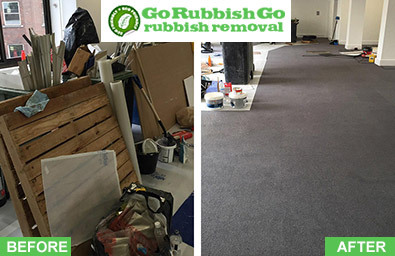 Our rubbish removal services are fast and easy to book, and we’ll send you the experienced and friendly team that you need to complete the job thoroughly and properly. Whether you need us for your home or garden our range of Blackheath rubbish clearance services will ensure that the job is completed for you, with no need to waste your time or energy. 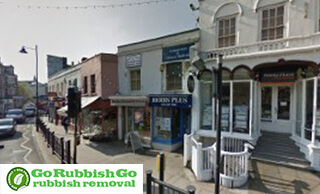 If you live in SE3 then hire Go Rubbish Go right now by calling 020 8610 9182! The rubbish in my attic was a huge source of stress for me, and I wanted it all gone as soon as possible. I looked on the internet and found this company in Blackheath SE3, which had the best reviews by far. I booked my waste collection service for the very next day and got a great deal despite how soon it was! The team that came to handle the rubbish worked very hard and got the job done in half the time I’d expected. This is worth every penny and saved me a lot of stress! Our company strives to bring you fast and reliable rubbish clearance in SE3 for every type of emergency. If you need us in a hurry we can help you in just a few hours with our same-day services, and we also offer lots of flexible bookings including evening, weekend and Bank Holiday appointments! If you hire us for your waste disposal in Blackheath, SE3 you won’t need to reschedule your appointments as we’re always available when you need us most. We’re here to serve any property in the SE3 area, with speedy and efficient services to collect every scrap of your waste, junk and clutter. Don’t wait any longer – find the right service for you by contacting our team today! We’re proud to be one of the most environmentally-conscious companies in the area, and if you care about the planet but you want reliable waste collection Blackheath service then we are just a single phone call away! When it comes to waste removal in SE3 it’s easy to cut corners, but our team work hard to recycle and reuse wherever we can to make sure we’re providing the greenest services for all of our clients. By using fuel-efficient vehicles for the collection and transportation of your waste we can help to keep your carbon footprint to a minimum. Learn more about how we care for the planet by contacting our team now on 020 8610 9182! Blackheath is a part of both the Royal Borough of Greenwich and the London Borough of Lewisham and is found in south east London. Blackheath is a popular residential area thanks to its traditional village vibe, which is reinforced with small shops, open green spaces, community ethics and classical architecture. There are lots of interesting sites in the area, including the Blackheath Conservatoire of Music and the Arts, Blackheath Halls for performances and Wernher art collection, which resides inside Ranger’s House. Thanks to the Blackheath station, travelling to and from the region is quick and reliable.